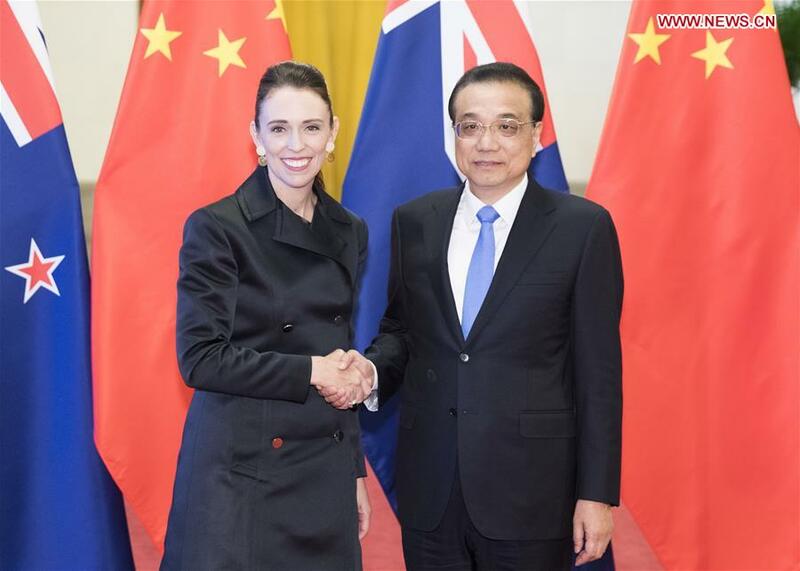 BEIJING, April 1 (Xinhua) -- Chinese Premier Li Keqiang held talks with visiting New Zealand's Prime Minister Jacinda Ardern here Monday, and the two sides agreed to strengthen cooperation and jointly safeguard rules-based multilateral trade system. Li once again expressed his condolences to Ardern over the deadly shooting incidents in New Zealand's Christchurch City. Stating that bilateral cooperation is "always standing at the forefront of cooperation between China and Western countries," Li said that the two countries now face new opportunities. China stands ready to synergize the Belt and Road Initiative with New Zealand's development strategies, tap into the potential and promote bilateral economic and trade cooperation, Li said. "The two sides should create a fair, just, transparent, convenient and non-discriminatory business environment for enterprises from both countries, accelerate talks on upgrading the bilateral free trade agreement and lift economic and trade cooperation to a higher level," he said. Li also called on the two sides to deepen cooperation in agriculture and animal husbandry, finance, taxation and infrastructure construction, and expand tourism cooperation and people-to-people and cultural exchanges. Both China and New Zealand are responsible countries with a tradition of independent diplomacy, Li said. "We are willing to work with New Zealand to strengthen communication and coordination within the multilateral mechanisms, jointly support rules-based multilateralism and the multilateral trade system, cope with global issues including climate change and promote regional and world peace and development." On bilateral ties, the Chinese premier said that the China-New Zealand relationship maintains a momentum of steady development. With the spirit of mutual respect and equal treatment, the two sides have been constantly strengthening political mutual trust, deepening pragmatic cooperation and strengthening people-to-people and cultural exchanges to pursue common interests and promote the advancement of China-New Zealand comprehensive strategic partnership, Li said, adding that this is not only in the fundamental interests of the two peoples but also conducive to the peace, stability and prosperity of the Asia-Pacific region. Ardern said that New Zealand, as one of the first Western countries to establish diplomatic relations with the People's Republic of China and sign a bilateral free trade agreement, pays high attention to ties with China and is firmly committed to the one-China policy. New Zealand welcomes investment from Chinese enterprises, Ardern said, pledging to create a sound business environment without discrimination against any enterprise from any country. "With a tradition of independent diplomacy, New Zealand will make decisions on major issues independently that are in the interests of its own," the prime minister said. She said New Zealand will work with China to speed up the work and advance talks on upgrading the free trade agreement, strengthen cooperation on issues including climate change and reform of the multilateral trade system and jointly safeguard the international order and the rules-based multilateral trade system. They also witnessed the signing of cooperation documents on taxation, agriculture, finance and scientific research, and issued a statement on climate change. Ardern arrived in Beijing on Sunday, and this is her first official visit to China since becoming New Zealand's prime minister.